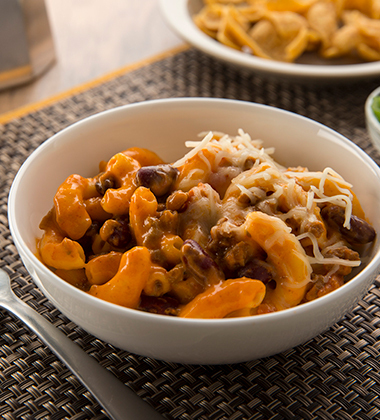 Chili Mac & Cheese made with Campbell's® Macaroni and Cheese and Campbell's® Signature Hearty Beef Chili with beans. 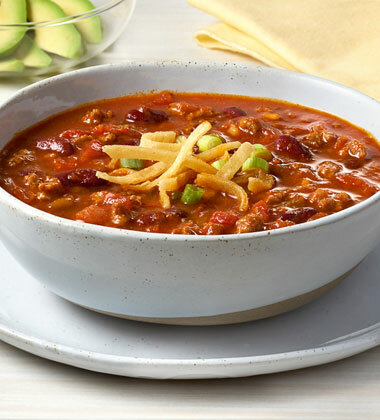 A good source of protein, this chili gets its spice from cayenne and chipotle peppers and its hearty texture from tender seasoned beef crumbles. 1. Thaw Campbells® Signature Macaroni and Cheese and Campbells® Signature Hearty Beef Bean with Chili according to package directions. 3. 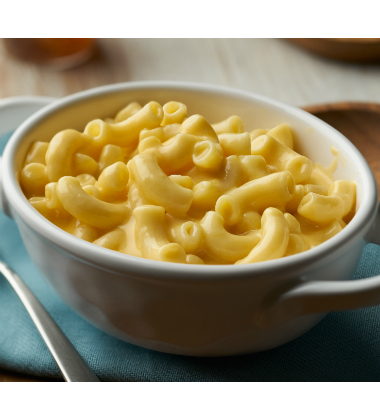 In large bowl, mix together thawed macaroni and chili. Stir until combined. Place in a greased oven-proof casserole dish. 4. Evenly top filled casserole dish with shredded cheese. 5. Bake for 30 minutes, or until golden brown. 1. Using 1- scant #8 scoop, portion about 1/2 cup (4 oz.) into bowl. 2. Top with crushed corn chips, or offer on the side. Serve immediately. For extra heat, try using Pepper Jack Cheese. Garnish with chopped green onion for extra color.